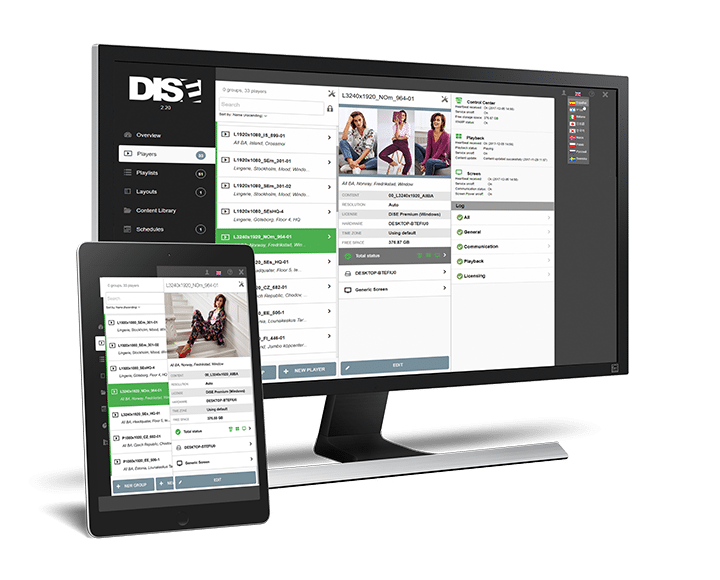 DISE provides a premium SaaS platform for retail Digital Signage, through a global partner network. DISE is the first choice of platform for retailers wanting to meet the next generation of customers with a seamless customer experience. DISE CX Portal is our web-based portal, where you can manage and schedule your content, and create dynamic experiences. Our portal is context-aware, which allows you to keep your Digital Signage communication relevant in all possible in-store situations. Intuitive workflows offered as a cloud service, all designed with retail in mind. There should be no limit to when and where you can manage and schedule your Digital Signage. You can access DISE CX Portal simply by logging on to our website. Our CX Portal is very easy to manage with its intuitive workflow and responsive interface. Users can easily and safely reach, and log into, the CX Portal with their existing browsers on PC, Mac or smartphone. With our CX Portal, content and campaigns can be managed and uploaded both locally, in the separate store locations, and centrally by the head office team. Our CX Portal is context-aware, which allows you to keep your Digital Signage communication relevant and up to date in all possible in-store situations. Our CX Portal is context aware, which allows your Digital Signage to stay relevant in any in-store situations. Our CX composer is a creative tool used to design templates, dynamic content and interactive experiences. The DISE Composer is often recognised as the market leader when it comes to high-performance content creations. Update your Digital Signage solution dynamically, in real-time. You have the option to bring in third-party content such as RSS feeds and social media. 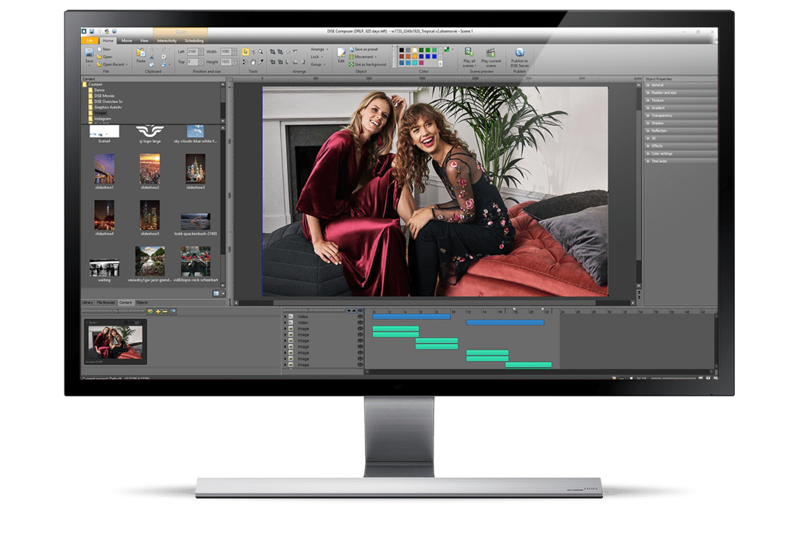 The DISE CX Composer is the designer-tool, which lets you create dynamic content with unlimited creative freedom. One of the big advantages with DISE is that you can create high-quality multi-screen solutions with flawless synchronization. 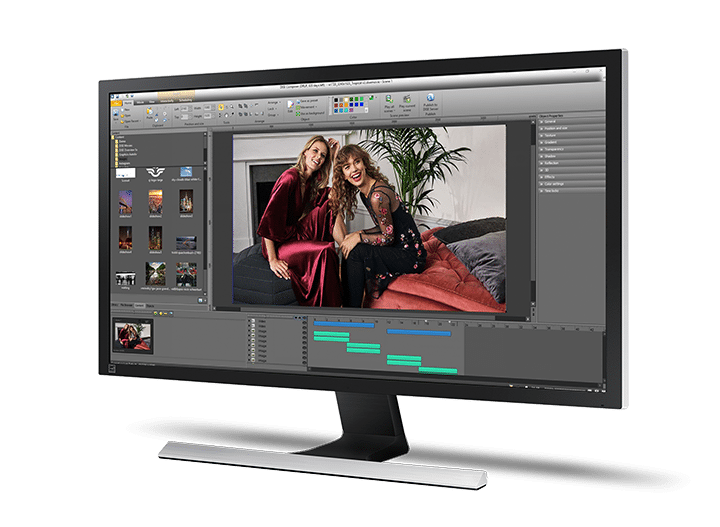 DISE CX Composer is the designer-tool who lets you create dynamic content with unlimited creative freedom. DISE offers two different player alternatives. The fully-fledged Premium version and the Lite version for less complex needs. DISE Premium is our most advanced player software. Choose DISE Premium when a high-performing, feature-rich or interactive solution is desired. So powerful and yet so easy to handle through our cloud-based interface. This is the product suite that will help you create and manage simultaneous, dynamic and reliable digital communications in-store. DISE Lite is a down-scaled version of Premium and is just as easy as it sounds. With our quick setup guide, you are ready to display content in no-time. DISE Lite is suitable for customers who look for a simple solution and want to display basic content such as images, text and videos. Our DISE Premium is our most advanced player software. Choose DISE Premium when a high performance, feature rich or interactive solution is wanted. So powerful and yet so easy to handle through our cloud-based interface. This is the product suite to create both simultaneous, dynamic and reliable digital communications in-store. DISE Lite is just as easy as it sounds. With our quick setup guide you are ready to play. DISE Lite is suitable for customers who look for a simple solution and want to display basic content such as images, text and videos.